The increased need for overall security and design flexibility at both home and the workplace has led to a greater reliance on access-control systems that incorporate new technology and personalised service from suppliers. In commercial and industrial sites, maintenance and engineering managers are finding that the benefits of facilitywide access control systems and smart, compact design go far beyond simply improving the level of security within buildings. In many cases, a well-designed and implemented system has resulted in reduced operating and maintenance costs. Managers can greatly reduce breakdown frustrations and the likelihood of deteriorated system performance by focusing attention on some of the most common trouble spots found in standard access doors. In this blog, we discuss Five Smart Ways to Improve Access Doors. Low maintenance costs and reliability are important factors to every owner when choosing an access door for a new building or replacing an existing roller shutter or sectional door. 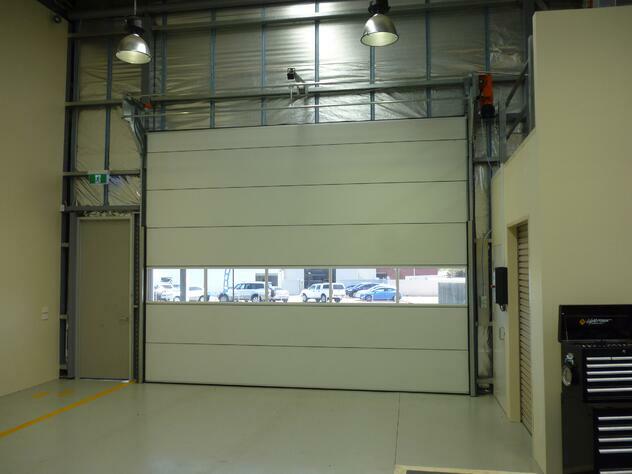 The traditional sectional door moves on rails into the building across the ceiling or directly above the access. To do this they use counter-balance springs, which are highly-tensioned steel springs that need regular maintenance to maintain their tension.Tensioned balancing springs are used to move the door and ensure that the door opens along the rails. This system has a high failure rate and the balancing springs have to be regularly maintained or replaced. If the springs break it can be a serious hazard. Furthermore the door continuing to work smoothly and reliably is an issue, with the complex arrangement of rails that the door moves on, requiring careful maintenance of the track rollers and hinges. At the same time the steel rail structure needs to be regularly checked for safety. The Compact Sectional door is often used as a replacement for roller shutters and the conventional bi-fold sectional doors. This folding door is self-supporting with side rails and folds up above the door opening, therefore does not have balance springs nor require a steel structure on the ceiling or above the access. 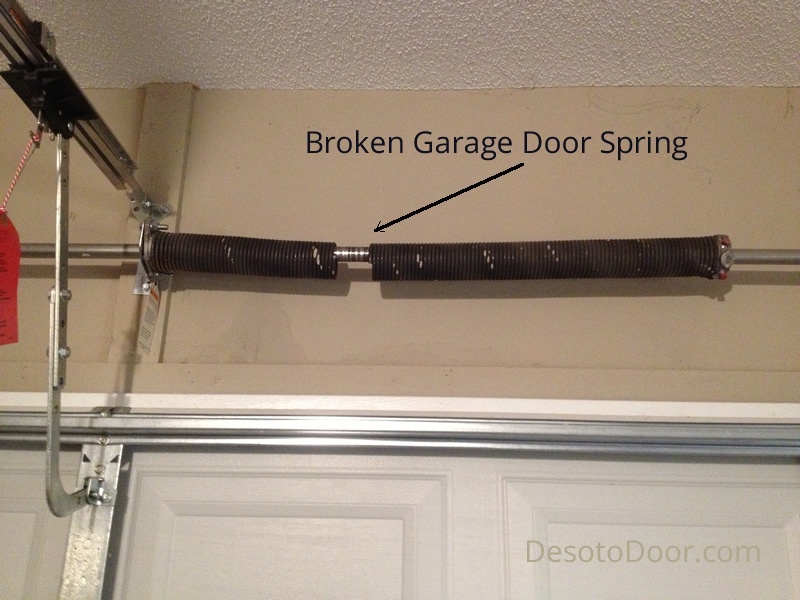 Since no balance springs are needed, the door blade is moved up by an electric motor and when closing gravity plays its part. The advantage of this is that there are lower maintenance costs because there is simply less to maintain. The quiet and gradual movement uses little energy and this means a longer lifespan and lower maintenance costs. 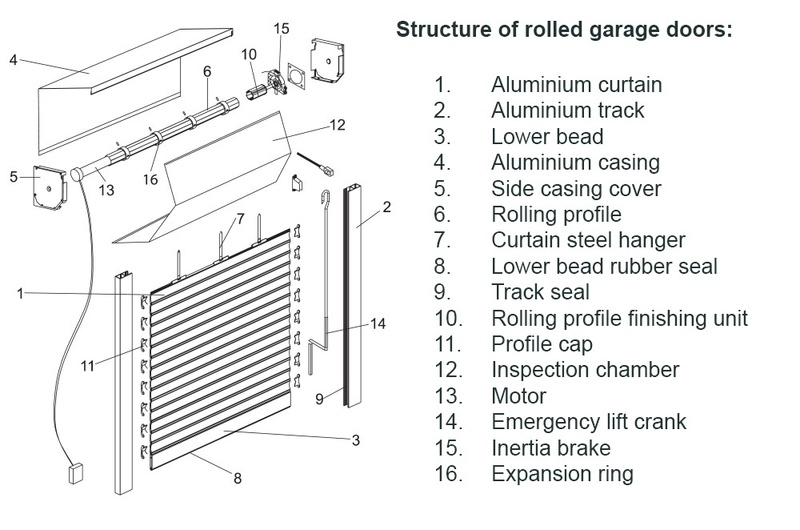 A common product which is used in both residential and industrial facilities is the steel roller shutter, which has a low up-front cost and needs minimal maintenance but also has many disadvantages, the first of which is poor insulation. For cold storage / distribution or any food related warehouse distribution, insulation of the doors is vital and can be a major source of energy loss. 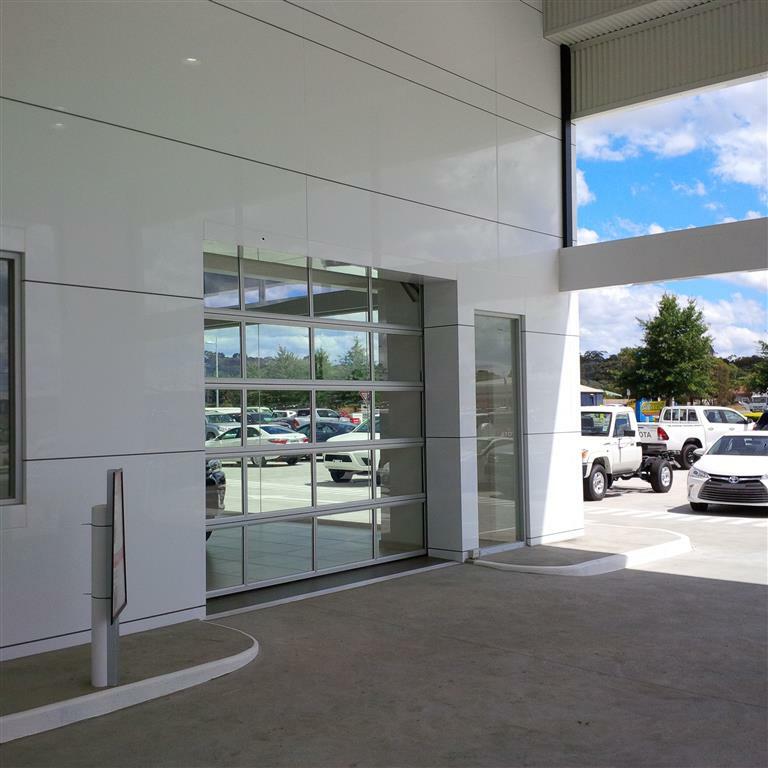 The basic aluminium roller shutter curtain / slats provide very little insulation against exterior weather conditions and also usually do not seal efficiently which also can allow plenty of dust, and other small pests to get into your facility. Even in the standard residential garage - customers are becoming much more conscious of the need to conserve energy, especially since garages are often utilised in more than one way - for both parking the family vehicle and also as a home workshop / household storage / a garage band for your teenager?? 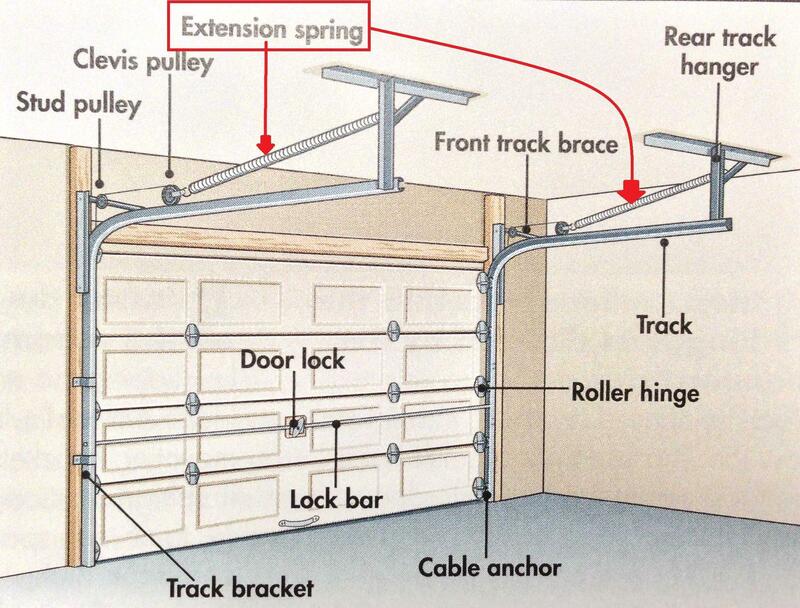 In order to keep the garage space dry, warm/cool (depending on the season), an insulated and well-sealed door is far more cost effective long term than a standard roller door. The Compact Sectional door is an insulated option which allows for double-glazed glass panels and / or insulated panels in a range of RAL colours to match the design of the building. Commercial and Industrial buildings including garages and basement car parking openings often require ducts, lighting and other installations to be fitted around the door and above the door internally. With a more compact sectional door design which has no overhead supports, you can cater for the needs of the doorway with little or no impact on the surrounding equipment and also be able to install lighting directly above the doorway where previous overhead doors would simply not allow. 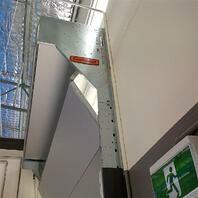 With an overhead door, the door blade raises up above the access on rails or moves into the building via a rail system. To open, the door requires clear space above the access to the height of the door. An average sectional door is 3.5 to 4 metres high. If the overhead door is moved into the building it runs on a rail system that either follows the roofline or goes straight into the building. Both options require a complex steel structure. 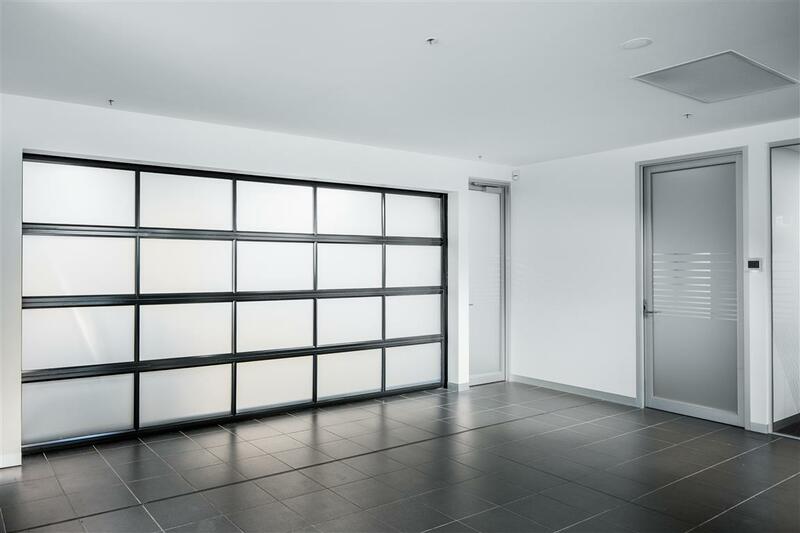 See a traditional tilt door (sectional door) on the left / Compact Sectional Door on the right. The Compact Folding Door provides a superior, concealed look and utilizes much less space than the conventional door, see below. 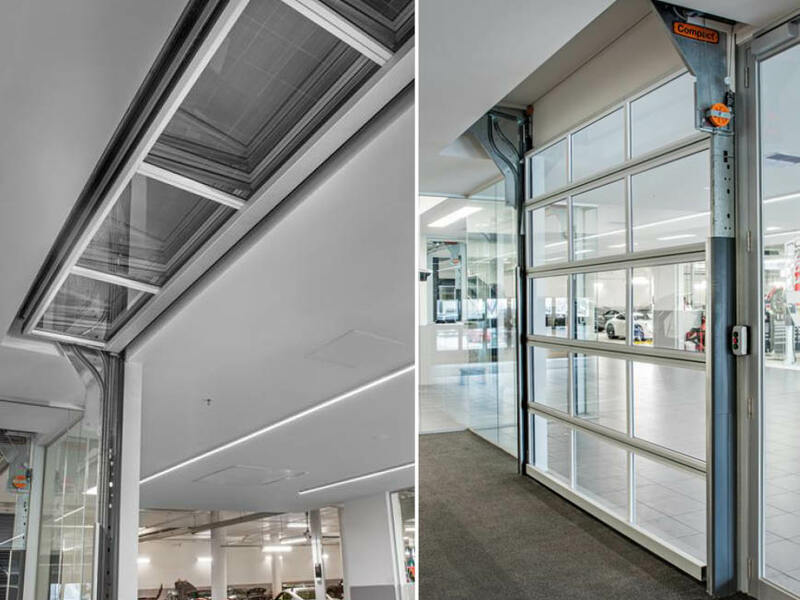 Worldwide, many government bodies have recognised the disadvantages of overhead doors and opted for a different solution: the Compact Sectional folding door. This industrial door folds up with its own self-supporting framework, so it requires no steel structure and little space. Total space utilization is significantly less with a Compact Sectional Door. As we know, design and architectural requirements differ for each and every project - so why not offer a unique access door matched to the build? The tasks facing architects when designing the new facilities, often involves saving space and creating a unity of inside and outside. However, this raises the problem that normal industrial doors do not correspond with the requirements of the design and up to now, it has been accepted that the doors are not coherent to the overall look of the architecture. The necessary space-saving cannot be achieved with an overhead door, and a roller shutter interferes with the freedom of the design. A combination of both had to be the solution. Solution: Space saving and design freedom combined in one industrial door. 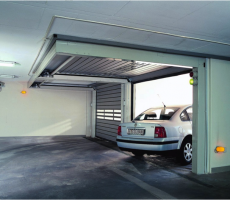 A Compact Sectional door could deal with both of these issues at once. Its folding system guarantees space-saving and makes it possible to design the door to meet the client’s requirements. With a coordinating use of colour and double glazing the Compact door can be precisely adapted to the design of the building in both colour and material. A number of aspects are also important to retail / residential and even commercial sites; the door should not take up too much space, they should leave room for the lighting, and they should move smoothly without a lot of noise or delay. Traditional roller shutter doors are excessively noisy in operation, and require regular lubrication to modify the noise. Even the installation manuals warn that loud noise is normal! With a unique, compact design, the Compact door fulfills one of the most important requirements – smooth operation. The panels fold up quietly and smoothly: the panels fold without noise, the electric motor is low noise and when the door closes the panels glide shut quietly using gravity. In a large distribution centre, there can be many doors in one area and limiting noise-levels makes an important contribution to improving working conditions. Noise levels are even more noticeable in residential areas, luxury apartments and facilities such as a car showrooms or a retail area where first impressions of your site are vital. An additional advantage is that the movement of the door consumes less energy and this guarantees a long life and low maintenance costs. It is worth looking into the benefits and restrictions of your doors before committing to the standard options. Although the upfront cost of a custom door will be larger than a standard, off-the-shelf option, the benefits and reduced ongoing maintenance costs of a custom product will outweight the initial investment and save you many headaches down the line. Have a look below at the comparisons between Compact Sectional Door and Conventional Industrial Door, or download the full comparisons leaflet here.